PASTURE VACUUMS AND SAVE TIME AND MONEY! ON SALE NOW WITH FREE SHIPPING!! Businesses from around the world are saving a great deal of time and money by purchasing a pasture vacuum? Pasture vacuums have proven to save both time and money for stables, builders, farmers and clean up crews from around the world. Back breaking stable chores are now quick and easy, harvesting fruits and nuts is consuming less time, clean up at building sites is taking hours instead of days. all due to the revolutionary Paddock Vac and Maxi Vac pasture vacuums! The Maxi Vac pasture vacuum is the largest pasture vacuum available. The Maxi Vac pasture vacuum features a 211 gallon storage capacity which is equivalent to approximately 5-6 wheelbarrow loads. Maxi VacThe Maxi Vac pasture vacuum is designed for easy towing behind a wide variety of ATV's, Mules, golf carts and riding lawnmowers. 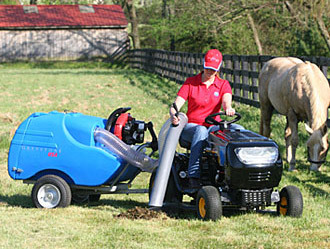 The Maxi Vac pasture vacuum exhibits all of the unique features of its predecessor, the original Paddock Vac, including an "A" grade Polyethylene body, a 5" diameter collection nozzle on a 8'' UV protected and reinforced hose and a Honda 4 stroke engine. The Maxi Vac pasture vacuum is constructed on a larger commercial grade powder coated steel frame with Grerystone heavy duty tires to carry the extra load this pasture vacuum is capable of handling. The Maxi Vac pasture vacuum is capable of collecting a wide range of material including manure, sawdust, wood shavings, leaves and rubbish around your property, in any conditions, wet or dry. 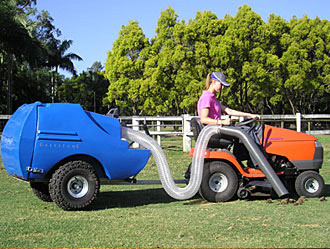 The Maxi Vac pasture vacuum is also used for harvesting walnuts, chestnuts, acorns or macadamia nuts. The larger storage capacity means less emptying and will save a great deal of time and money on large clean up jobs. The Paddock Vac is the original Greystone pasture vacuum and its success has grown world-wide. The Paddock Vac was originally designed to clean up and maintain horse and alpaca pastures. Purchasers of the Paddock Vac quickly found a multitude of further uses for this pasture vacuum. The Paddock Vac has proven its value and versatility in everything from construction clean up to harvesting fruits and nuts. The global success of the original Paddock Vac spawned the idea and design for the new larger version, the Maxi Vac. The Paddock Vac features a tough and durable 105 gallon capacity storage compartment (3-4 wheelbarrow loads) made of "A" grade Polyethylene set on a sturdy, powder coated steel frame. The Paddock Vac is designed to be towed behind most ATV's, Mules, golf carts and riding lawnmowers and will handle a wide range of wet or dry debris. The Paddock Vac features a UV protected 5" diameter nozzle attached to a 8' UV protected hose. The ergonomic nozzle handles allow the pasture vacuum to be used while remaining seated on the towing vehicle. The pivoted frame allows the pasture vacuum to be effortlessly tipped up and emptied without detaching the Paddock Vac from the towing vehicle. Fittings are made of marine grade stainless steel. Hose Length (including Plastic Nozzle) 12'2" 12'2"